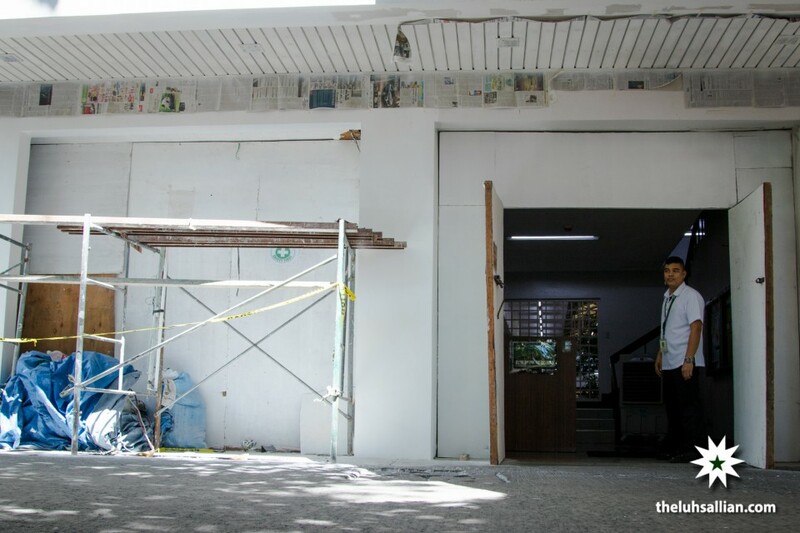 Following recent announcements regarding the transfer of the Gokongwei College of Engineering (GCOE) from Velasco to Gokongwei Hall, students from the College of Computer Studies (CCS) organized a coalition named “Protect Goks Movement” and have started various efforts to barricade the building and prevent the planned move. Addressing the threat of increased foreign presence within the walls of Gokongwei, “Protect Goks Movement” was organized by the Computer Studies Government (CSG) in cooperation with the various student organizations of CCS, including the La Salle Computer Society (LSCS). “Ever since the 24/7 Study Facility was launched in Gokongwei Hall, students outside of CCS have started flocking to our home. Over time, they have outnumbered us in our own territory. It seems as if they’re not content with just invading our space, and now the administration wants to force us out of it,” said CSG President and Protect Goks Movement spokesperson Rastine Pinlac. “At first, we started by placing toll gates in front of Agno Gate, the Gokongwei-Taft Gate, and the Warp Zone to impose a fee on non-CCS students coming in. As time progressed, it proved inadequate to keep everyone out,” Pinlac explained. To remedy the situation, the Movement has employed workers to construct a barrier around the building. A proposed gated-wall is currently under construction at the Agno Gate and is estimated to be completed by the first trimester of the next academic year. “Right now, you can see a roof being constructed at the Agno Gate. Within a month, the roof will be supplemented with a wall that can keep outsiders out and a gate where we can monitor the flow of people going inside. As of the moment, we’re only constructing at Agno due to costs, but we plan to extend it to the Taft gate and the Warp Zone as well,” the spokesperson said. While the barricades are under construction and further development is anticipated not until next academic year, students from CCS in the meantime have resolved to form a human shield around their beloved building. “We love our home and we will protect it with our lives. If we need to form a human shield around Goks to repel outsiders, then we will do it without question,” shared Pinlac. While CCS students have vehemently opposed the planned transfer, University Chancellor Dr. Robert Roleda shared his thoughts on the move. “I don’t like to think about it as CCS moving out. I like to think about it as CCS moving in with the rest of the University,” he shares. According to Roleda, the transfer was motivated by the recent curriculum change drafted in the form of Project RevEd. “Computer studies sees itself constantly changing and evolving. These days, it is uncommon to not see our CCS graduates permeating every facet of society. In the future, their importance will keep increasing. We modelled the curriculum change to encourage cooperation between different degrees and specializations, especially with those in the field of computer studies. To foster better communication and cooperation, we need to move CCS closer to the others,” he says. “Besides, according to our research, we found out that CCS students hardly ever leave their building. Our new curriculum encourages you to explore as much as you can and learn from every corner of the University. We need to coax our computer studies students out. We need to see them more in the University,” Roleda states. “While I think the move is made with good intentions, it’s still not ideal. All of our equipment, laboratories, and computers are here in Goks. Moving will mean that the equipment will move with us too,” shares Julie Tan (III, CS-ST). Another student, Gee Nodalo (III, CS-ST) also shares the same sentiments. “I don’t think it’s a problem only for CCS students, but also for the engineering students. Moving them to Goks means that they will move farther away from their equipment and laboratories,” she says. Other students, however, support the transfer. “I like how the Gokongwei College of Engineering will finally be in Gokongwei Hall. It fits. I also like that we’re now closer to Agno. For me, it’s more convenient and will save us more time between our classes,” shares Rain Ansan (III, BS-CIV-STE).